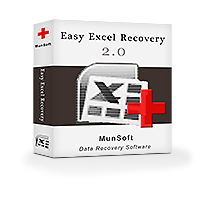 Easy Excel Recovery is a software product that was developed for restoring damaged Excel files. While the built-in recovery tool only works with light damage, this program recovers even heavily damaged documents and spreadsheets. 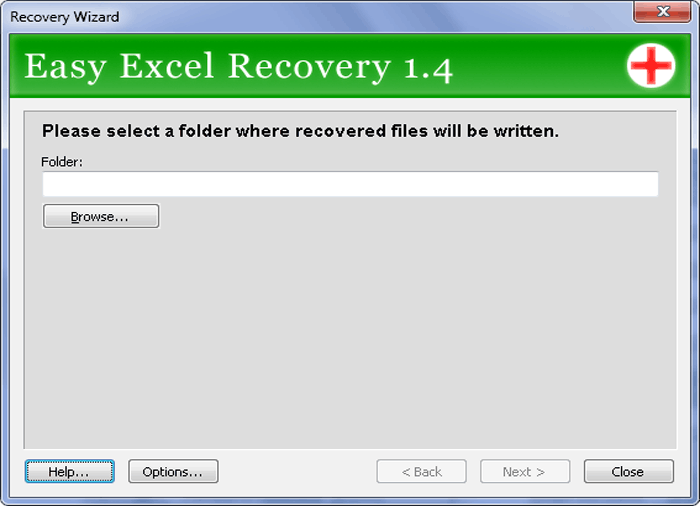 The recovery is made possible by unique algorithms that restore both data and file structure of an Excel file. 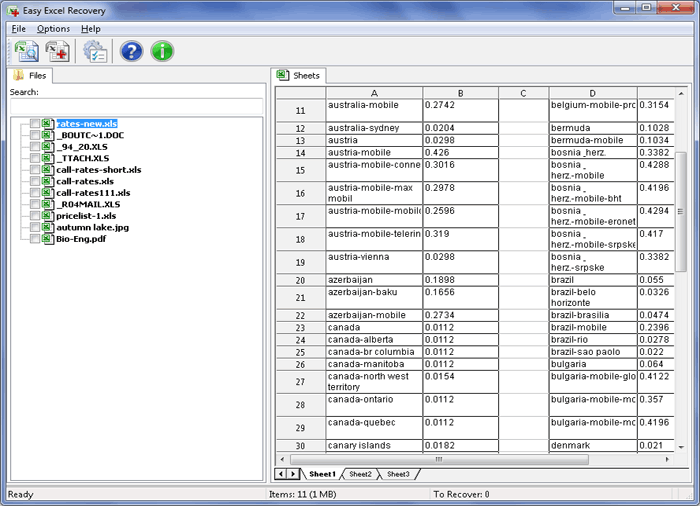 The program works with XLS and XLSX files made by various versions of Excel. Not only damaged files can be restored but deleted data as well. Even if the storage device was formatted, damaged or suffered a virus attack, the data can still be restored as long as the information is physically present on the disk and is not yet overwritten. When searching for deleted files, the scan covers the whole hard drive or flash drive and performs the Excel recovery. The files can be stored in parts in different sectors of the drive but the program puts all the data pieces back together. The program has a full preview which lets a user see the files and their contents prior to the actual recovery. For Excel files, multiple sheets can be previewed. Right after the scanning or after opening the Excel file in the program, the preview shows the data and if it’s there, then the file can be recovered. Maximum possible information that can be restored is extracted by Easy Excel Recovery, making it a stand-out program that has the capacity of restoring even hopeless files. Although if there’s no data left, or if the format of the file doesn’t correspond with the data that’s inside, the recovery can’t be guaranteed. However, this is an exception, most cases are recoverable. A simplistic design doesn’t let unnecessary functions get in the way. The interface is user-friendly and only requires a few mouse clicks to be made in order to restore data. The built-in Wizard guides through the recovery, offering useful insights along the way. The program works on Windows, multiple versions supported. Not only XLS files are supported but XLSX too. 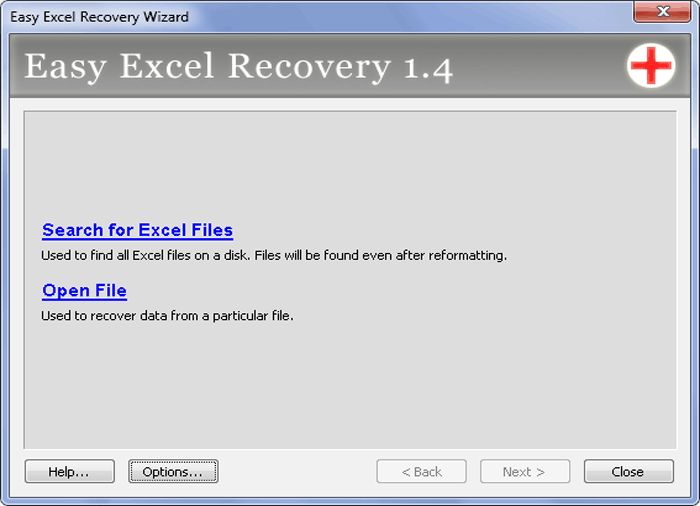 Microsoft Excel recovery can be performed any time and there are no restrictions on how many files can be recovered. The trial version is available for download for free and once registered, it allows saving the recovered files to the disk. The program is a powerful tool for restoring damaged Excel files, offering quality results with as little effort as possible, the name “Easy” speaks for itself. works on Windows 2000, XP, Server 2003, Vista, Server 2008, 7, 8, 10 and Server 2012.